Recording iPhone or iPad screen through Mac Yosemite.. There are some way to record iPhone or IPad’s screen using in-built apps but need to pay for it or unstable. Yosemite, the new version of MacOS, supports screen recording functionality through Quicktime player. Ever needed to create a tutorial or walkthrough for something on iOS? Or do you just fancy projecting your iPhone or iPad screen onto your Mac’s display? Previously the only way to do so was complicated setups involving AirPlay mirroring and third-party software. With Yosemite all you need do is attach the device to your Mac via USB and then open QuickTime Player. Then select File > New Movie Recording. QuickTime will default to your Mac’s iSight camera (assuming it has one), but click the small down arrow alongside the record button and your iPad or iPhone will show-up as an option. This entry was posted in Apple, Mac OS and tagged iPad, iphone, screen recording, Yosemite on November 14, 2014 by enddl22. 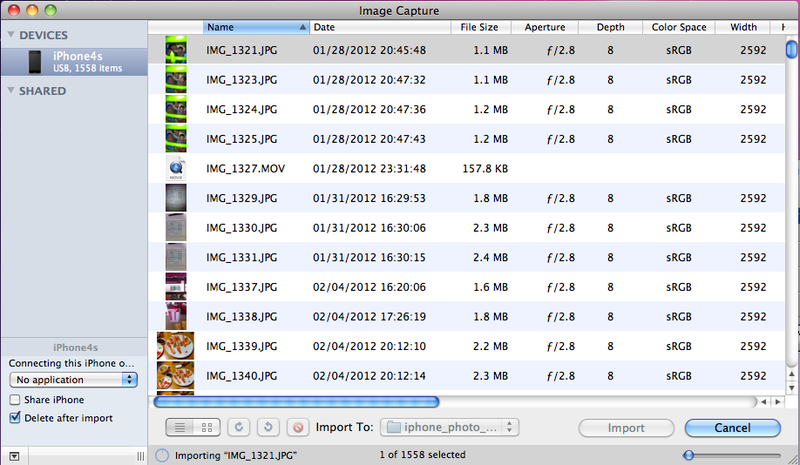 Using “Image Capture” on Mac for transferring photos from iPhone. 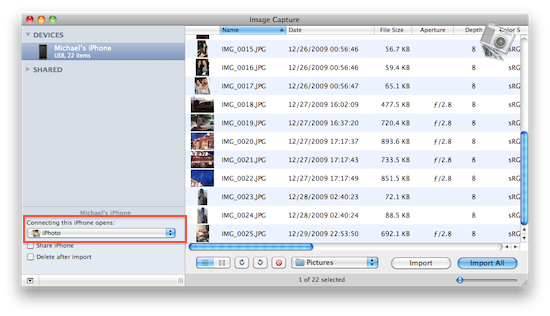 Image Capture on Mac can be used for transferring photos btw a iPhone and your Mac. I have used iPhoto for managing photos but more like “Image Capture” for especially backing up since it provides quite intuitive user interface like “Finder”. Simply plugged in your iphone and launch image capture then it will automatically detect a phone. Create a folder and copy. In addition, there are simple options you can choose e.g., Sharing iPhone, Delete after import..
More details are the following snap shot will explain. This entry was posted in Apple, Mac OS and tagged image capture, iphone on March 16, 2013 by enddl22. More Mac 101, tips and tricks for novice Mac users. I love iPhoto. I use it for most of my photo editing. The thing I don’t like about iPhoto is how it opens each and every time I connect my iPhone to my Mac. What strikes my as plain silly is that, since the introduction of the iPhone two and a half years ago, Apple has not built in an option in the iTunes iPhone status window to disable the automatic iPhoto launch every time you plug in your iPhone. If you want to take control of this behavior, and you’d prefer to stick with Apple’s built-in tools (rather than take advantage of the free and easy Cameras prefpane) there is good news: there’s a simple way to disable this ‘feature’ and it doesn’t involvecommand line stuff. Even better, it isn’t an “all or nothing” solution – eg: you can still have iPhoto automatically open when you connect your camera, but not have it open when you connect your iPhone. Aron mentioned this approach a few months ago but I thought it would be helpful to walk through it in detail. It should be noted that this solution only works on Mac OS X 10.6 Snow Leopard. If you are running 10.5 or earlier, you’ll have to use one of the solutions noted above; we recommend the free Cameras preference pane as a quick fix. You’ll see the image above is of iPhoto’s preferences. You may think the option of disabling iPhone auto-open is in there, but it’s not. 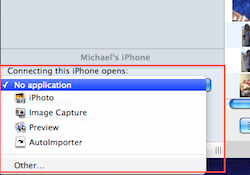 To stop the iPhone from opening iPhoto you actually need to launch the Image Capture application. Step 1: Launch Image Capture (Applications>Image Capture). If your iPhone isn’t plugged in already, plug it in to the USB port on your Mac. It should then show up in the devices source list. Step 2: Make sure you have the iPhone selected in the source list. When you do, you should see any photos you have on the iPhone appear in the right-hand column of the Image Capture application. Step 3: At the bottom of the source list, you’ll see your iPhone’s name then, below that, you’ll see the words “Connecting this iPhone opens:” and a drop-down menu. Select “No application.” Now close the Image Capture app and you’re done. No more iPhone opening up iPhoto, but your other cameras will still auto-launch iPhoto when they are connected! This entry was posted in Apple, Mac OS and tagged don't open, iphone, iphoto on August 16, 2011 by enddl22.